The research is a step toward answering the question of whether e-cigarettes are significantly safer than tobacco cigarettes, as some have suggested. A new UCLA study suggests that e-cigarettes may not be significantly safer than tobacco cigarettes. The research, which was conducted on cultured cells, found that e-cigarettes contain toxic substances and nanoparticles that could kill the top layer of skin cells in the oral cavity. Based on their findings, the researchers believe that similar results could happen in a human study and that e-cigarettes could increase users’ risk for oral disease. The findings, published online in the journal PLOS One, also suggest that health care providers should do more to raise public awareness of the products’ health risks. The use of e-cigarettes has increased dramatically in the past few years, particularly among women and young people. (The Centers for Disease Control found that 2.4 million middle school and high school students were using e-cigarettes in 2014.) And health agencies in some nations, including the United Kingdom, have recommended e-cigarettes as a tobacco-cessation product for smokers who want to quit tobacco. Although the effects of conventional cigarette smoke on human health have been well documented, there has been much less research on the health risks of e-cigarettes, particularly their effect on the oral cavity — the portion of the mouth behind the teeth and gums. 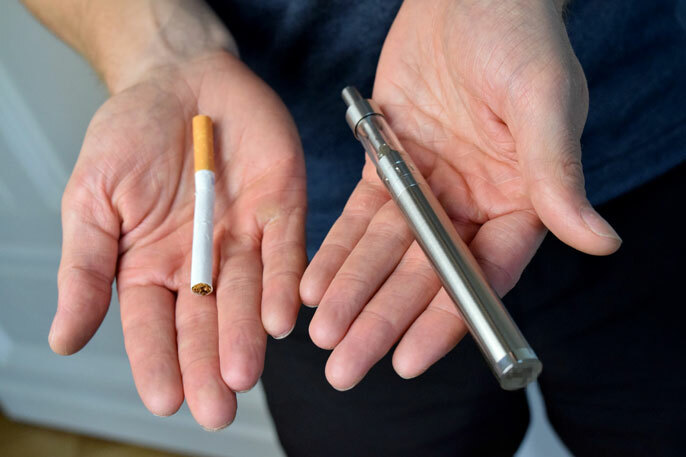 The UCLA research team, led by Dr. Shen Hu, an associate professor of oral biology and medicine at the UCLA School of Dentistry, took cell cultures from the outermost layer of the oral cavity and exposed the cells to two different brands of e-cigarette vapor for 24 hours. The vapor, containing varying amounts of nicotine or menthol, was generated by a machine built to “smoke” cigarettes like a human would. The researchers then measured the particle concentration and size distribution of the simulated vapors. The research team found that e-cigarette vapors, which contain nanoparticles of metal, silica and carbon, vary in concentration depending on the e-cigarette brand and flavor. Laboratory tests on cultured cell lines showed that e-cigarette vapors may significantly weaken the oral cavity’s natural defense mechanism by decreasing the levels of an antioxidant called glutathione. This caused roughly 85 percent of the tested cells to die. Hu, the study’s lead author said his team will next translate its findings to a human study. Other authors of the study were Grace Eoon Hye Ji and Dr. Diana Messadi of UCLA Dentistry, Bingbing Sun and Dr. Tian Xia of the David Geffen School of Medicine at UCLA, Chong Hyun Chang of the California Nanosystems Institute at UCLA, Shi Shu and Yifang Zhu of the UCLA Fielding School of Public Health, and Tongke Zhao, who holds appointments at both the Fielding School and Peking University.